The newest event at STAGE WEST IS an event. “Game Show” does have a rather minimal plot about the star’s psychological salary negotiations, but it’s the game that makes the evening so much fun. 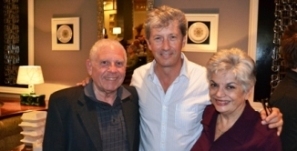 Adding Charles Shaughnessy to the mix is pure apple-polishing. Remember his suave imperturbable ‘Sheffield’ opposed to Fran Drescher’s shrieking shenanigans; he still projects that charismatic, twinkle-eyed demeanor as Troy, the host of the game. Audiences are insinuated into the evening as the on-stage crew start prepping for a performance. Then, Peter Mikhail’s pre-show warm-up moves around the tables followed by the on-stage TV cameras. (A caveat –don’t pick your nose…it may be visible on the huge monitors!) Mikhail exudes a dynamism that is contagious. We applaud on cue, and are immediately caught up in the count-down excitement. Then, they and we; are ‘on-Air’. Audience members are chosen; brought on stage, introduced and then compete on their knowledge of trivia (answers are given as such – not in the form of a question!). The cerebral level is more Jeopardy than the flimsy continually-applauding juvenile stuff on Wheel of Fortune. The functioning camera crews are so effective that the contestant’s facial expressions are palpable, natural & priceless. All the while, Shaughnessy keeps up the patter so there’s absolutely no slacking of pace or intensity. Every smile, frown, puzzlement or asides and posture conveys a bonding with his co-cast members as well as the drafted on-stage victims. I imagine a certain amount of improvisation must be necessitated by their somewhat ingenuous responses to his interrogations. By the way ladies; in profile Shaughnessy bears a striking resemblance to Richard Gere… same greying mane; same firm chin; and same classic silhouette. He receives strong support from a delicious Chantal Perron as his producer and comedic relief from both Andrew Cohen and Scott Olynek. The set, designed by Ian Martens not only oozes realism but is efficaciously adaptable for the ‘commercial-breaks’ backstage manoeuvrings. From this writer’s recollection of my own segment on Cogeco’s “Main Street”, an overhead boom camera would add even more realism, and certainly entertain those seated beneath its swinging hazard. I don’t know how the pre-selection selection process works, but one couple, coincidently seated in the next booth, had just become engaged. On hearing their names, the muse was compelled to engage both in what she calls ‘Jewish Geography’; an intrusive grilling to see if there might be a familial relationship. Usually, there is! Another contestant was from Hamilton and her response to Shaughnessy’s inquiry about the city, mentioned its ‘Steeltown’. Richard; I meant my invitation to come out and see our waterfalls; our escarpment vistas, our Gage Park; Hess village, our art gallery and especially our vibrancy. Call me!!! GAME SHOW is fun; fast-moving and coupled with the always on-going buffet creativity is a sure-fire fun evening. One subscriber told me that given his and his mate’s hectic lives, possessing a set of tickets means that they are assured of at least five yearly occasions when they can share something enjoyable together… works for me. Another game show icon – Bob Barker, said it best: – “COME ON DOWN”; you’ll be glad you did.